A ring that belonged to author Jane Austen has gone on public display for the first time since a successful campaign to stop US singer Kelly Clarkson taking it out of the UK. 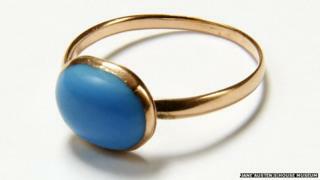 The 31-year-old Texan had bought the ring at auction for £152,450 in 2012. But Culture minister Ed Vaizey imposed an export bar on it and a campaign last year saw the ring bought for the Jane Austen's House Museum in Hampshire. The turquoise and gold ring is now on permanent display at the museum. Ms Clarkson, who collects Austen items, owns what appears to be a replica of the ring and was set to take the real thing back to the US after outbidding the museum at the auction. But Mr Vaizey said he wanted the "national treasure" to be "saved for the nation". The ring was indeed saved after the museum, situated at Austen's former home in Chawton, launched a Bring the Ring Home campaign. Donations flooded in from around in the world, including an anonymous donation of £100,000, to match the price Ms Clarkson paid - as per the conditions of the temporary export bar. The singer, who won the American Idol TV show in 2002, previously said she was "happy to know that so many Jane Austen fans will get to see" the ring at the museum and called it a "beautiful national treasure". Media captionKelly Clarkson has been seen wearing what is believed to be a replica of the ring in the US, including at President Obama's inauguration. Museum curator Mary Guyatt called Ms Clarkson "gracious" and said she hoped "to welcome Ms Clarkson at the museum in the future". The museum already displays two other pieces of jewellery owned by the writer - a turquoise beaded bracelet and a topaz cross. Ms Guyatt said it was very exciting to have the only three items of jewellery known to have belonged to the author exhibited in one place and said it was "testament to Austen's reputation" that the campaign was so successful. The ring passed first to the author's sister Cassandra, who then gave it to her sister-in-law Eleanor Austen on her engagement to the Reverend Henry Thomas Austen, Jane and Cassandra's brother. Austen, who lived most of her life in Hampshire, is one of English literature's most celebrated authors. The building that is now the museum was her home for the last eight years of her life and is where she completed all of her novels, including Pride & Prejudice, Sense & Sensibility and Emma. Later in the year it is planning a series of events to mark the 200th Anniversary of Austen's novel Mansfield Park, which was the first of her books to be written entirely at the house in Chawton.